James C Flockhart was one of the best endurance runners Scotland has ever produced and was the first Scot (in a very short list) to win the International Cross-Country title. He exploded on the scene in 1932 without having had any sort of apprenticeship and the impact is described in Colin Shields’s “Whatever the Weather” centenary history of the NCCU. “Jimmy Flockhart was a native of Fauldhouse in Lanarkshire. When he was at school he regularly ran the three and a half miles from his home to East Kilbride to collect the Saturday evening sports pages with the football results. A former cyclist who in his own words ‘simply murdered himself in road racing’, he was only five foot five and a half inches in height and weighed eight and a half stone when he took up running at the age of 23. Back to Colin’s account for the race itself and the rest of the season. “His performance in the club trials showed such promise that he went straight into the first team for the Midland Relay at Hamilton Park Racecourse. In the race, running the third fastest lap of the day in his first open race, he led Shettleston to victory for the first time, defeating holders Plebeian by 200 yards. Flockhart fulfilled all expectations when winning the Midland 7 Mile title a few months later defeating 233 rivals from 21 clubs. The 5’5.5”, 8 stone 7 pounds Flockhart rapidly improved with regular training. At that time his training schedule consisted of a fast 3.5 mile run on Tuesday, a medium 6 miles on Thursday and a 9 mile cross-country run on Saturday, always finishing with plenty in reserve. The largest gathering of runners ever seen in Scotland took place at Hamilton Park Racecourse for the 1933 Scottish national championship. Suttie Smith, running for Canon ASC after another of his frequent club changes, led for the first five miles with Flockhart and Corporal James Wilson (Royal Scots and Edinburgh Southern Harriers) in close attendance. At seven and a half miles, Flockhart had an 80 yards lead from Wilson with Suttie Smith a further 50 yards behind. Over the final lap of the 10 miles race, Flockhart drew away in easy fashion to double his lead over Wilson with Suttie Smith, failing in his attempt to record six individual wins in a row, finishing third. Shettleston broke Maryhill’s long sequence of team triumphs in a closely contested team race they won with 154 points from Springburn 167 points with just 10 points covering teams from second to fourth. Flockhart’s win at the first attempt earned him both the Senior and National titles – only the third man to achieve the double in 30 years. These titles together with the club and Midland District titles, and his rapid improvement as he gained experience, made him ‘in Scottish eyes’ the favourite for the international race at Caerleon racecourse in Newport, Wales. He made a good start to the race and, in company with teammates Suttie Smith and Robert Sutherland, stayed close on the heels of the leader for 6 miles. All three Scots displayed such pace and endurance that hopes of a Scottish victory were high. Running in heatwave conditions, Flockhart suffered an injured foot crossing a section of rough, uneven, stoney ground. As the leading group approached the steep 250 feet high ‘Heartbreak Hill’ at 7 miles he started to drop behind due to his injury. At this point Scotland, in their best ever performance in the International, had their counting 6 men in the first 13 runners and looked to be challenging England for the team title. Heartbreak Hill proved the decisive point in the whole race. For, as Scottish runners faltered and tired to lose precious places, English runners picked up places to finish 6 in the top 9 to Scotland’s 6 in 18, and win the team race with 32 points to Scotland’s 62 with France third on 109 points. There had been no Edinburgh to Glasgow relay in 1932 after two being run in 1931, so he had to delay that experience until 1933. There were two races that year as well and on 8th April 1933 James Flockhart ran in his first E-G. Running on the difficult and long sixth stage, he recorded the fastest time of the day but only held on to the fourth place that he had been given. Nevertheless, fastest time of the day on the sixth is excellent. The National cross-country championships were held at Ayr in 1934 over the course that would be used for the international at the end of March. Flockhart retained his title with some ease – 100 yards up at half distance, he increased this to about 200 with two miles to go but R Sutherland cut it back to ‘only’ 150 yards as the champion eased back approaching the finish. On to the international at home and the Scots set themselves a target of four in the first ten and were hopeful of a home victory. Unfortunately there was a very fast start to the race which caught the Scots unawares and as Colin Shields says, they were found wanting in both strength and stamina at the end of the race. Flockhart worked his way through to sixth position but with only three in the first twelve the team could only finish third. In the Edinburgh to Glasgow relay in November, Flockhart represented his club on the second stage where again he ran the fastest time of the day with his team finishing sixth. In the National in 1935, there was a surprise result. The ‘Whatever the Weather’ account reads as follows. The international that year was in Paris and Shields reports on the race. Although not known as a track runner, Flockhart won four senior SAAA championship races. The first was in 1935 when he won the 6 Miles in 31:22.6. In the Edinburgh to Glasgow Relay in November, Flockhart again ran the second stage with a repeat of his previous performance: like 1934, he ran on the second stage, as in 1934 he moved up from second to first and as in 1934 he had the fastest time on the stage. Having won the 6 Miles SAAA title in 1935, James went one better in 1936 when he won not only the 6 miles but also the 10 miles. Winning times were 31:16.0 and 54:04.2. The 1936 Edinburgh to Glasgow had Flockhart on the second stage again. This time he took his club from sixth to first with the second fastest time of the day with the club finishing second. At the other end of the 1936- 37 season he won his fourth national title at Redford Barracks in 56:46 from Emmet Farrell on 57:04 and Robert Sutherland in 57:13. The centenary history remarks that in bitterly cold conditions Flockhart had little difficulty in retaining his title. But the best was still to come – the race that defined his career, the 1937 international at Stockel Racecourse in Brussels on 20th March. The Glasgow Herald report on the race the following Monday had a photograph of Flockhart in action in the race and a headline that read “Flockhart’s Bid For Scotland. Individual Triumph at Brussels. “Although Scotland only finished fourth, their national champion, JC Flockhart, scored a magnificent individual triumph, covering the course of about nine miles in 49 min 54 4-5 sec. He finished 65 seconds ahead of the Frenchman, Siccard. Lockhart’s victory was one of the most convincing of the series, and after his many disappointments in this event, it was most encouraging to see him outpace such noted rivals. The most satisfactory feature however was the excellent tactics he revealed. Several times it looked as though he might be tempted to follow the impetuous foreign runners in their spasmodic bursts, but he restrained himself admirably, and when he did make his big effort in the last one and a half miles, no one could match his pace. Three noted runners were forced to retire at half distance. Jack Holden, three times international champion, injured himself and had to be assisted from the track. M Larbi, who is one of the fastest Frenchmen, injured his stomach, and V Honoras, ex-champion of Belgium, developed cramp and had to be carried off for first-aid. King Leopold of Belgium was an interested spectator throughout, and immediately the race was finished, Flockhart was escorted to the royal box and presented to the King. His Majesty discussed the race with the champion and, after congratulating him warmly, presented him with a plaque in commemoration of his achievement. After winning the international championship, Flockhart eased back a bit but still managed to win the SAAA 10 miles championship that summer in 53:16.8. Colin Shields spoke of the winter 1937-38 campaign as follows: “James Flockhart, after his 1937 international victory at Brussels decided on a late start to the 1937/38 season and had a very low key approach to the season up to Christmas. He finished 60 yards behind SAAA 6 Miles champion W Donaldson in Shettleston’s trial for the Midland relay championship. On the day of the relay race at Garscadden , Donaldson pulled Shettleston from fourth into a big lead at half distance with the fastest lap of the day leaving James Flockhart and W Sutherland an easy task over the final two laps. In the Edinburgh to Glasgow race in November, he was on the sixth leg again and again ran the fastest time of the day (22 seconds faster than the second man) but could only hold sixth place for the team. In the National of 1938, Flockhart was sixth but nevertheless was eligible for selection for the international. Shields points out that it was a disappointing race for Flockhart, best in Europe less than a year earlier, who had been passed by Tom Gibson and Tom Lamb (both Bellahouston) in the final half mile when he was badly tired after a serious lack of training had robbed him of his dream of a fifth individual victory to equal the record total held jointly by Suttie Smith and Andrew Hannah. The international was a disappointment with only champion Emmet Farrell running well. Flockhart was down the field in thirty seventh place. In the Edinburgh to Glasgow in November he was again on the sixth stage and was equal second fastest with Tommy Lamb of Bellahouston with Emmet Farrell of the winning Maryhill Harriers team having the fastest lap of the day. 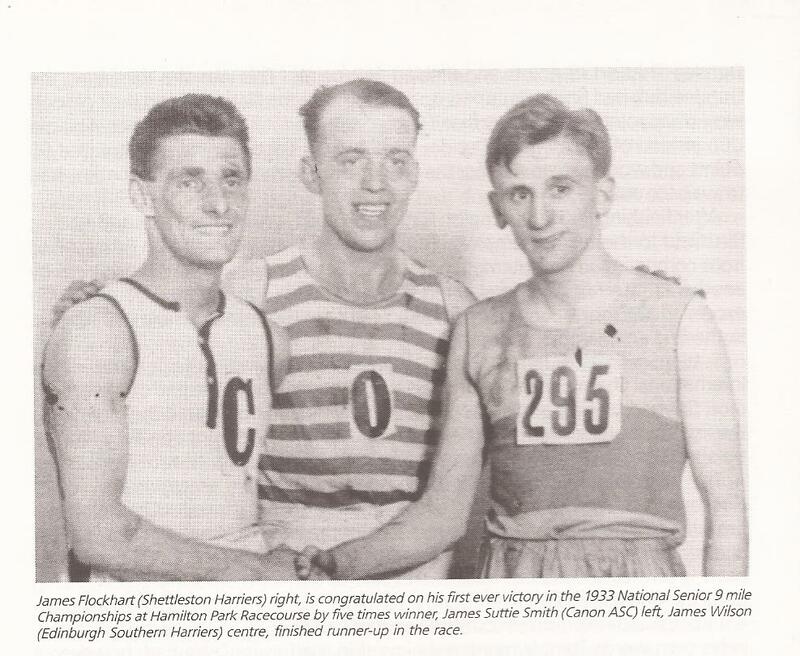 In the national in 1939, Flockhart finished seventh and third Shettleston Harrier to finish, behind A Craig 3rd and J Ross 4th with the team in third place. The international that year was at Ely Racecourse in Cardiff and Flockhart ran well to be twelfth, second Scot and fourth British runner in the race. The Scottish Cross-Country Association had a programme of muster runs at various venues in Central and Western Scotland and held their final ‘unofficial’ cross-country championship in March 1946 at Hampden Park to help choose their team for the international to be held at Ayr. Charlie Mclelland of Shettleston won from Emmet Farrell and Gordon Porteous with James Flockhart in fourth. The SCCA had been formed at the start of the war “to preserve cross-country running in Scotland and present it in as healthy a state as possible to the post-war era.” The body wound itself up in August 1946 and handed over to the NCCU. The first post-war international championships were a great success. With NCCU secretary George Dallas being the guiding light behind the organisation and Tom Fraser acting as Appeal Fund Secretary. The French and Belgian teams travelled by ship, a full turn-out of the Home Countries ensured that all six countries were well represented. Scottish hospitality was fulsome, as Colin Shields, reports with teams and officials being taken to Hampden Park and Rangers Football Ground the day before the race, with Glasgow Corporation entertaining the teams to dinner in the City Chambers and a celebratory after race banquet at Ayr Town Hall. To complete the hospitality, the teams and officials each received a bottle of whisky, a beautifully bound volume of Robert Burns and a tartan tie. In season 1946-47 the National was held at Lanark Racecourse when the country had been in the grip of exceptionally bad winter weather with snow and frost and on the day of the race, many football and rugby matches were cancelled because of the hard, rutted and dangerous conditions. Of course that did not deter the runners! In the first official Senior Championships after the war, 230 runners tackled the 10 mile course. It was won by Andy Forbes (Victoria Park) who had already won the Midlands (Junior) title and he became only the sixth man ever to win the Junior and Senior titles in the same year. “James Flockhart had a disastrous run, finishing only 40th, but he had injured his foot on icy roads just 48 hours before the race and was unable to wear spikes. Taking this into account, the Scottish selectors showed their faith in his ability, and his talent of bringing himself to peak fitness for important races, by selecting him for the international at the Hippodrome de St Cloud in Paris. There Flockhart revealed himself worthy of their trust finishing seventh just 50 seconds behind R Pujazon (France) and being first Scot and second Briton (behind A Olney of England) home. This was his best post-war performance and he went on to gain two more vests in 1948 and 1949 to bring his total to 11 – equalling Dunky Wright’s record of appearances. The above report of course is from “Whatever the Weather”. The National of 1948 took place at Ayr Racecourse and was won by Emmet Farrell who had previously won the event ten years before in 1938 and was another who had seen what would have been his best years taken from him by the War. Flockhart was fourth this time and again selected for the international, held this time at Reading where he finished thirty seventh. In the National of 1949, held in heavy rain that had been falling for 24 hours at Ayr Racecourse, conditions were said to be the worst for over 30 years. Uncovered barbed wire fences resulted in numerous competitors finishing bleeding profusely and a stream on the course which had to be crossed three times was swollen and in spate. Jim Fleming of Motherwell won the race from James Reid (West Kilbride) and Emmet Farrell. In the international that year Flockhart was fortieth and it was to be his last international appearance. Later that year he ran in the revived Edinburgh to Glasgow relay in April and took on the second stage again for the team that won the event. Seven months later on 21st November 1949, the club achieved the unique feat of winning the race twice in the same year with Flockhart on the sixth stage where he lost one place to Andy Forbes of Victoria Park AAC. He ran in the National at Hamilton in 1950 where he finished eighteenth for the winning Shettleston team. This was his last National and his last championship was the following season when he tried to win the club championship yet again only to be beaten into second place by Ben Bickerton. Flockhart was undoubtedly a top class runner who would have mixed it with the best in any era – good on the road and on the track but outstanding over the country at a time when cross-country required real skill and strategy to negotiate the natural hazards around the course which involved, fences, burns, ditches and dykes unlike the current grassy race tracks. “I enjoyed reading your piece on Jimmy Flockhart. He is without doubt one of Scotland’s all -time greatest cross-country exponents. But did you know that that he was not born by that name Flockhart? That , I suspect, is the reason why statisticians have been unable to determine his date of birth. I discovered this after failing to find a birth record for a James C Flockhart. Working back from his death notice, I knew he must have been born during the period between 1908 and 1910. However, no such record exists! The answer to the mystery may be found many years later, in his marriage certificate, dated 13 July 1933. Herein we find him named “James Coats Flockhart (formerly McLean) , housepainter (journeyman)”. The answer, then , is that he was born James Coats McLean in Govanhill on 26 April 1909. His father, Neil Coats, a professional soldier in the Argyll and Sutherland Highlanders, was killed in action in Belgium in 1915. This we also glean from his marriage certificate. His mother Jeanie later remarried, adopting the Flockhart name. “J.C.” died in 1981 in East Kilbride. Very interesting and informative indeed!